Anyone who’s ever wondered what ‘Drops of Jupiter’ might look like, or wanted to ‘Meet Virginia,’ has enjoyed the eclectic images of Grammy-winning rock group, Train. From their initial, self-titled, self released album, every record has been RIAA-certified platinum or better. Now, with the release of their critically-acclaimed fifth album For Me, It’s You and upcoming tour, it appears this Train shows no signs of slowing down. In the midst of preparing for a cross-country spring tour, lead vocalist and songwriter Pat Monahan happily finds his group in high demand. While returning from Canada one evening, Monahan took time to talk about his band’s success and the real stories behind the enigmatic lyrics of some of his biggest hits. Train’s first single, ‘Free,’ was featured in the Fox Television series, Party of Five and the success of ‘Meet Virginia’ propelled the group’s debut CD to a run of four weeks atop Billboard’s Heatseekers chart. 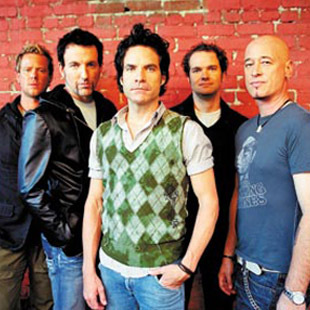 In 2001, Train released its’ second album, Drops of Jupiter, and the title track, ‘Drops of Jupiter (Tell Me),’ spent a total of 53 weeks on Billboard’s Hot 100 singles chart. The song won a Grammy for Best Rock Song and a Best Arrangement Grammy for Paul Buckmaster’s lush orchestration. For Train’s third album, the band reunited with Brendan O’Brien (who produced Drops of Jupiter) to create My Private Nation. From this album, two singles were released; ‘Calling All Angels,’ which received two Grammy nominations, and ‘When I Look To The Sky.” Another hit, ‘Ordinary,’ was featured on the Spiderman 2 soundtrack. After a successful live album (called Alive At Last, Train went back into the studio to record For Me, It’s You, again with producer O’Brien. Released earlier this year, the album’s first single, ‘Cab,’ is currently moving up the charts. The album features two new band members: bassist Johnny Colt (originally from the Black Crowes), and keyboardist Brandon Bush (John Mayer, Shawn Mullins).